On Thursday, 7 October 2010, Pope Benedict XVI accepted the resignation of Cardinal Claudio Hummes from the post of Prefect of the Congregation for Clergy; and appointed Italian Archbishop Mauro Piacenza to succeed Cardinal Hummes to the position. Archbishop Piacenza is a “siriano,” i.e., one of the “Siri Boys” educated and formed in the highly conservative tradition (read Latin liturgy and Council of Trent-style liturgy) of the late and far to the Right conservative Cardinal Giuseppe Siri (1906-1989). 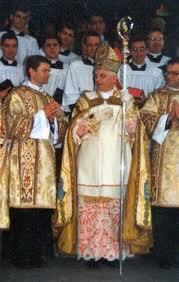 Another “Siri Boy” now serving Pope Benedict is Monsignor Guido Marini, the Papal Master of Ceremonies. (4) Nineteenth century clerical dress. 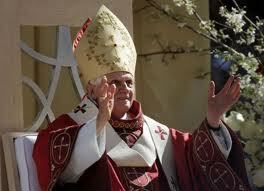 Piacenza could be in line to be named cardinal in a consistory Benedict XVI is expected to call for late November. Announcement of the names of new cardinals is expected one month before, probably after the conclusion of the October 10-24 Synod of Bishops for the Middle East. Speaking of the Synod of Bishops, one of the “experts” appointed by Pope Benedict to Synod of Bishops’ Special Assembly for the Middle East is Don Nicola Bux. both the shortage of ordained ministers problem and the problem of clerical sexual abuse…. 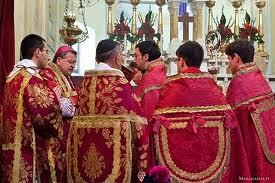 Happy Birthday Vatican II! We miss you! 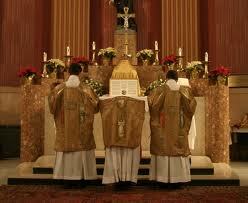 and his cohorts were gleaming with silver and gold. A friend told me about this site and I would like to subscribe to your emails. Bless your courage in keeping the Spirit alive!